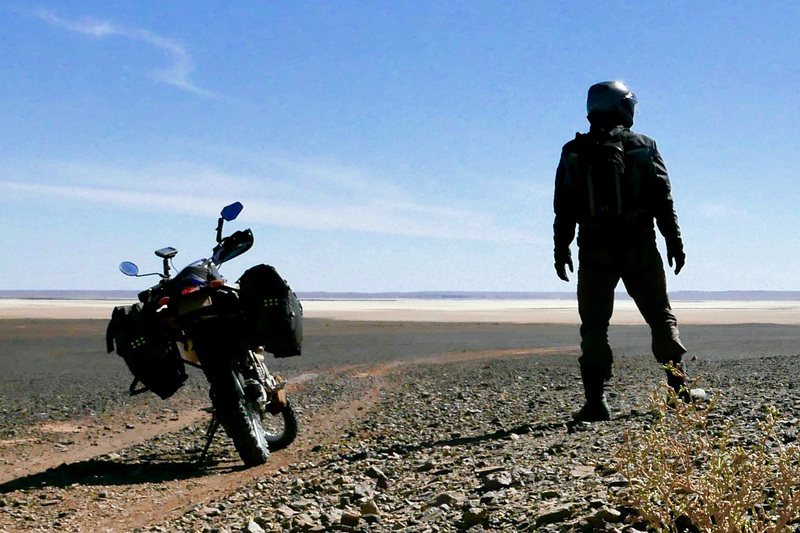 Kriega’s new Overlander-S is their second iteration of a luggage system suited to bike travel. A few years ago they brought out a similar plate-on-rack idea (below right) but, with modularity using their existing 15-litre packs (or Rotopax), which were semi-permanently riveted to the HDPE plate which itself attached to the rack with fiddly skewer clamps. I never used them myself, but has a close look once and it wasn’t really for me. 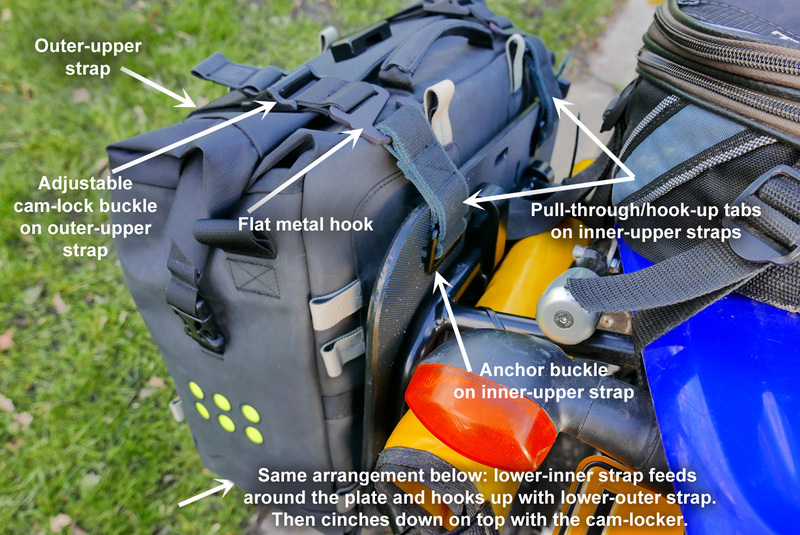 I prefer one big bag, like the Adventure Spec Magadans, and an easier way of getting the bags on and off a rack. 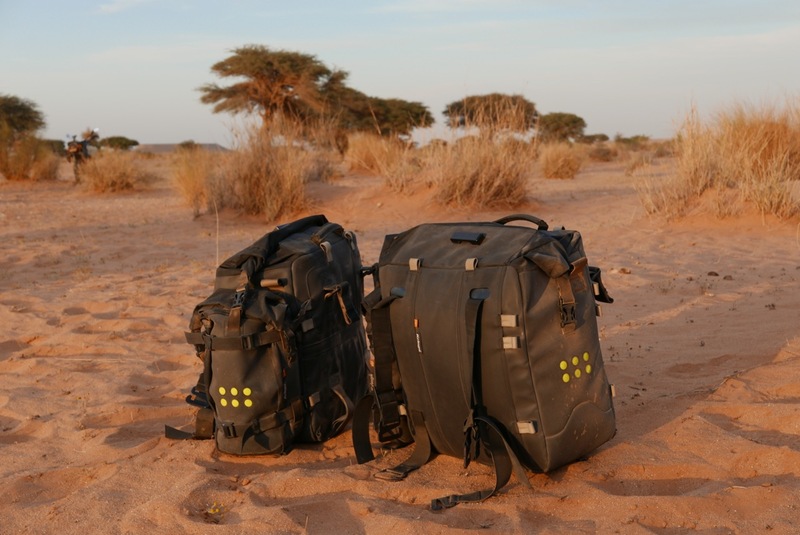 I just spent a month in southern Morocco and Western Sahara with prototypes of Kriega’s new OS-32 panniers, the core of their new Overlander-S system (below right) using a similar bag-on-plate-on-rack system. My load was about 10-15kgs each side, depending on water, and I was set up for tentless camping with a few days food. A nifty Giant Loop tankbag, a trusty old Touratech tail pouch and Kriega R15 backpack with Hydrapak added up to the rest of my baggage. With the OS-32s the HDPE plate ‘platform’ in Kriegaspeak (left) is bolted to a rack. Why use a plate, you might ask? It’s just added weight and expense. Both true but a plate is actually a smart way of avoiding getting bogged down with manufacturing metal racks to suit scores of different bikes. HDPE (think: kitchen chopping board) is great stuff: light, rigid and dead easy to drill or even just poke with a red-hot skewer. 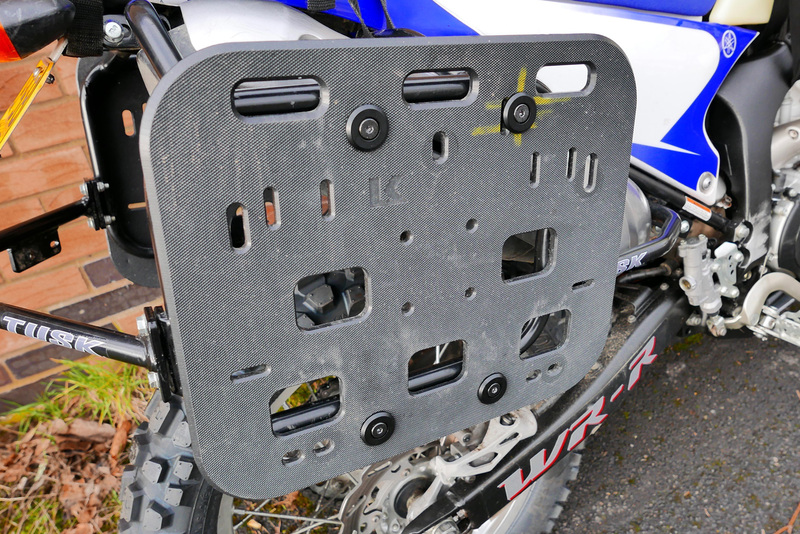 The Kriega plate and its adapter clamps have been designed and cut to fit just about any round-tube, 18mm/¾” rack and offer a broad, grippy surface for the hypalon-backed bag to cinch up against. 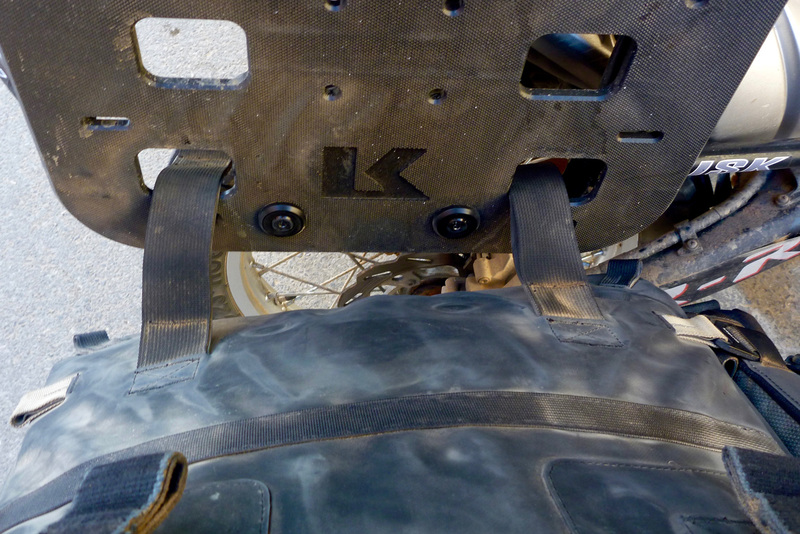 Using the plate means the Kreiga to any-rack interface is solid and reliable, while the demountable Kriega-plate to Kriega-bag element uses Kriega’s own strap-up solution to make a secure fitting (see below). 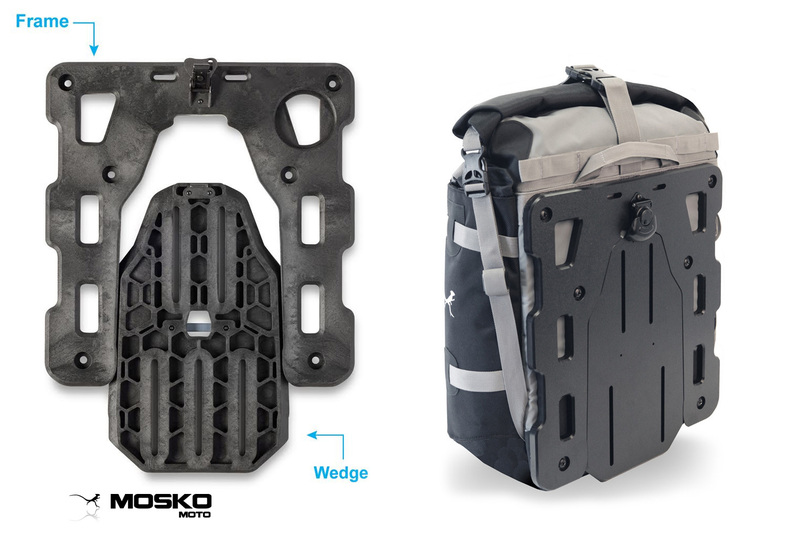 Mosko Moto also use a plate for their Backcountry bags; a GRP wedge and ‘frame’ (right). 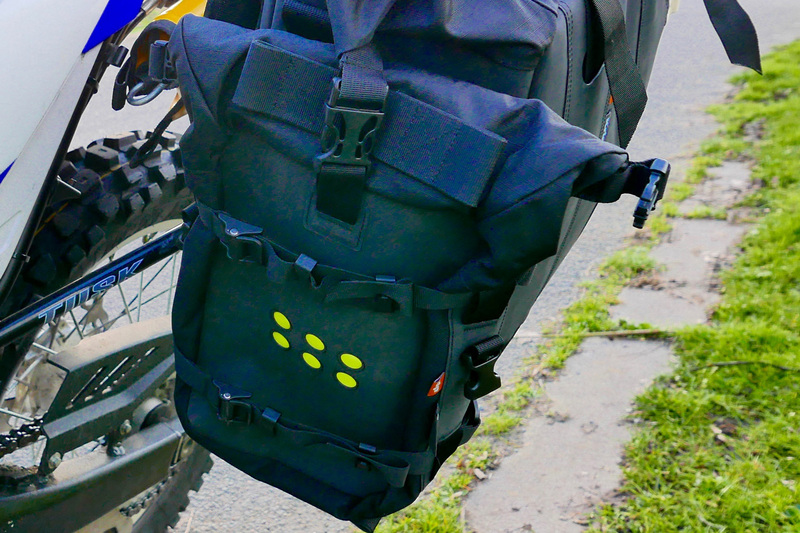 The wedge attaches upwards to your bike rack, and the full-width frame to the back of the bag which slots down onto the wedge and clips in with a latch. Originals were also made in HDPE, but either wore too quickly or were too soft. GRP (fibreglass) gets round this, but can be brittle stuff. Not tried it or even seen Backcountry bags, but intuitively I feel old-school strapping of a hypalon-backed bag to a plate spreads and secures loads better than two bits of GRP slotting and clipping together, and Kriega have devised a neat solution to quickly attach and remove the bags – a key element. 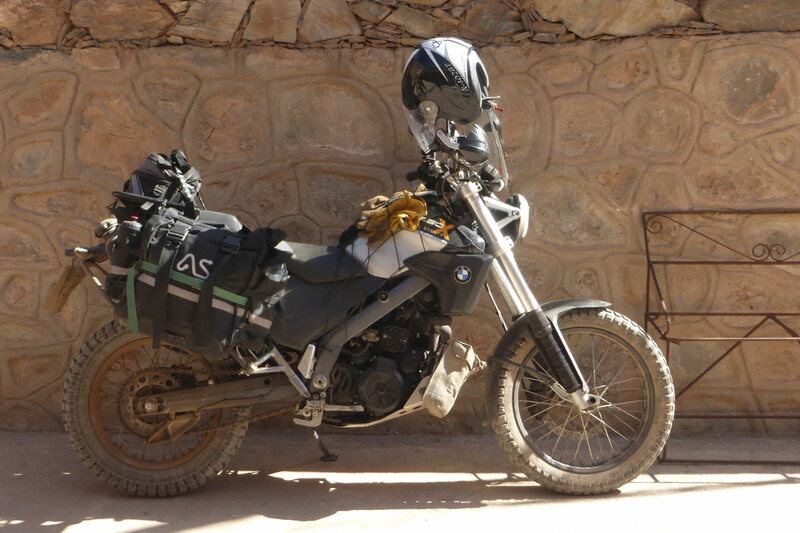 For a big trip with heavy/variable loads, a travel bike is better off with a rack, unless you take very little or can be certain your gear will stay put, be easy to get to and remove, and of course, won’t catch fire off the pipe (right; Niger ’86). 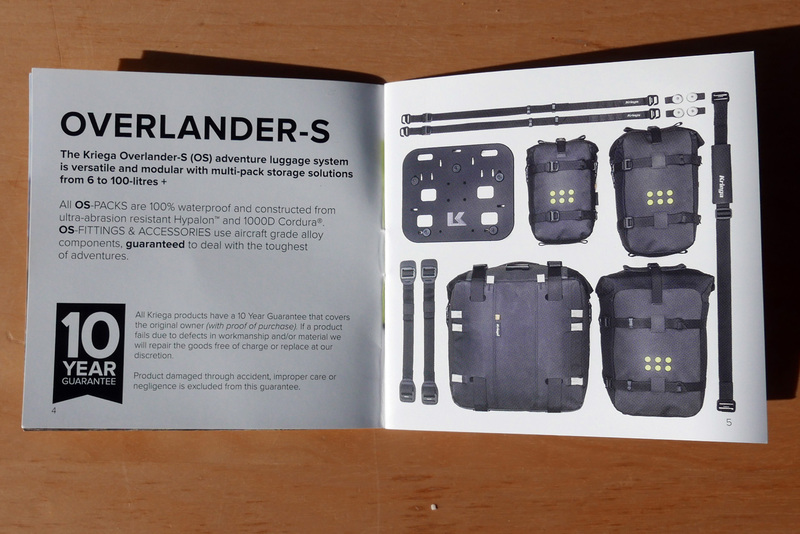 It’s a load-carrying interface between your baggage and your bike to enable secure fitting on a variety of bikes, like saddles on a horse, a roofrack on your car, a packframe in a rucksack, or even the shoes on your feet. You can use Kriega’s OS-32s as throwovers, in which case you could dispense with the plate, but you will need some sort of rack to stop them swinging about. You could duplicate the HDPE plate’s strap holes on a rack frame to effectively mount in the same way. It won’t spread the load and secure the bag as well, but it will save 2.4kg of plate and a hundred quid. I used a Tusk rack from Rocky Mountain (4kg, left). Great price, well made in ¾” and solid mounting. It stood up to the beating well and was only spoiled by the clumsy extra bracketry for mounting hard cases. 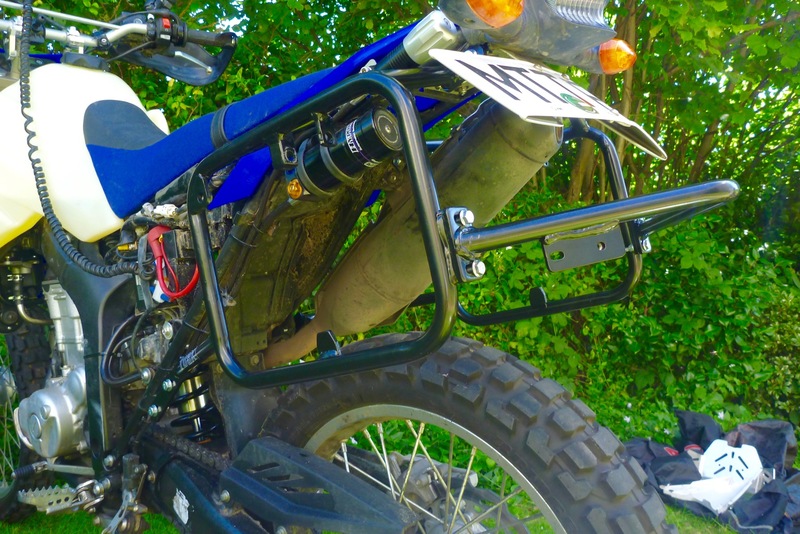 I removed what I could from the rack, but some welded-on bits (right) got in the way of mounting the Kriega rack plate as low and far forward as practical. I suppose I could have ground them off. The plates (1.2kg each) have four slots for the upper and lower bag straps. 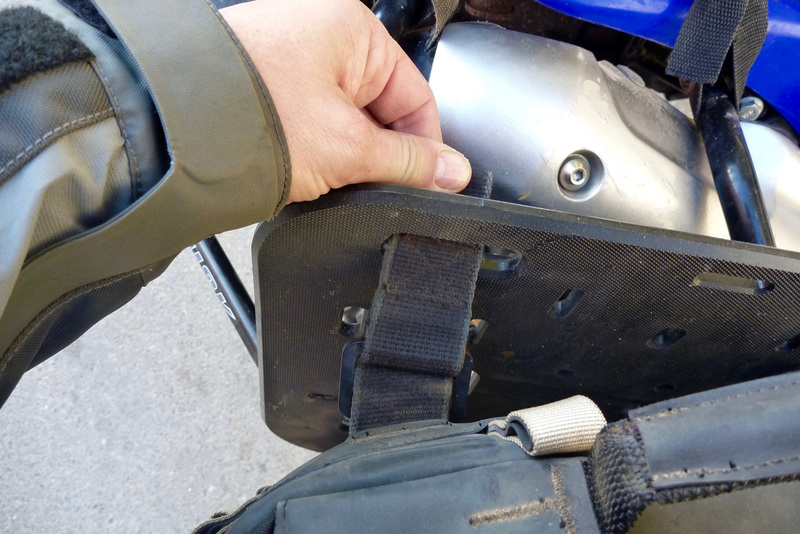 To mount a bag (2.6kg), you rest it on your knee and feed the lower straps through – below. 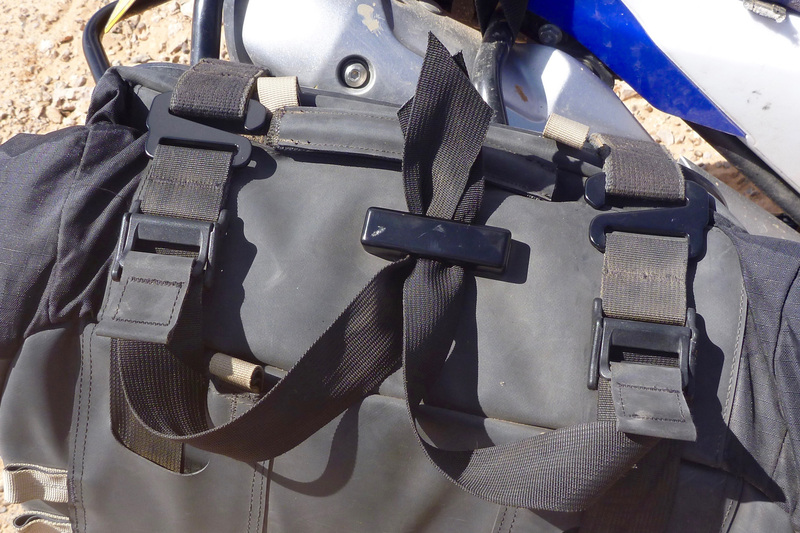 Then you feed the top straps through the slots and pull the ‘anchor buckle’ through – works a bit like a shirt button and similar to Wolfman’s idea which cinched smaller bags directly onto racks. Viewed from behind – the anchor buckles (as I call them) pull through and take the weight. With those buckles pulled through, the bag now hangs on the plate not unlike a throwover. You could probably ride on roads like that. 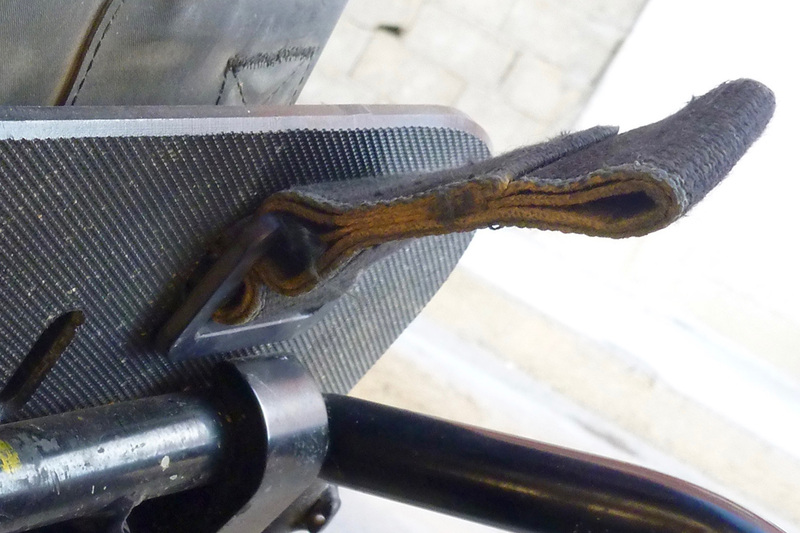 For a bombproof mounting, you now crouch down and connect the dangling lower straps to the outer strap with a flat metal hook. This is about as arduous and fiddly as the whole bag-mounting process gets. Then, on top you do the same: hook the outer strap to the chunky tab off the anchor buckle, then cinch it all up and lock it down with the cam buckle. Sorted! Mounting takes about 40 secs each side once you’re practised – demounting a bit less. One of the best things about the Magadans are the big exterior pockets – a lot of soft luggageers dodge this necessity. 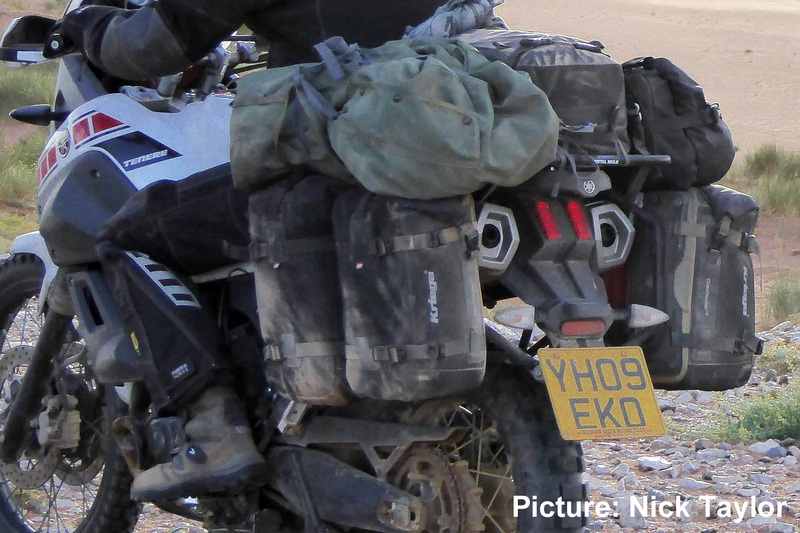 Kriega supplied me with two OS6, 6-litre strap-on pockets (550g) which are part of the OS system and which I hooked on the front of the bags. They’re ideal for daily or heavy items to keep the CoG central. The OS6s cinch down on themselves to stop stuff shaking about. You could put two more on the back and another on top. 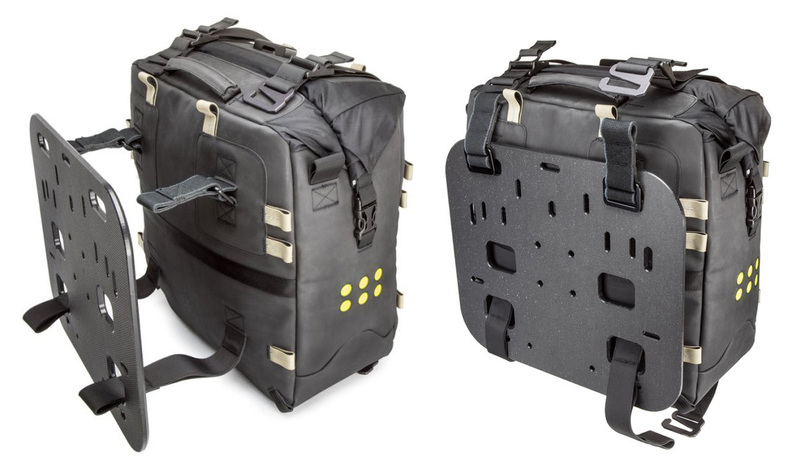 There are over a dozen hook-on tabs on the main bags and the system includes an optional pair of shoulder straps which make it easier to do the bike-to-hotel-room-walk in one go. All bags came with the usual Kriega white liners to enhance rummaging visibility and which are more durable than previous liners. I didn’t use them, and bagged stuff individually. Even then, what rain I got – a few hours a couple of times – didn’t penetrate the bags. They’re covered in hypalon panels (think: whitewater raft fabric; lasts for decades) which slow the wetting out of the bag’s Cordura body and of course will scoff at any abrasion, be it the constant rubbing against the plate, or sliding down the road hoping not to loosen your load. Daytime access requires uncam-locking and loosening the top straps and pushing to the sides, then unclipping the roll top folds from the sides and unrolling – about 15 secs. On the top panel you’ll see a chunky metal fitting to feed a cable lock, like the Steel Core recommended by Mosko Moto. I initially just used them to secure the loose strap ends (left). Kriega tell me if I fold the ends over they’ll have the rigidity to slip into the outer sleeves, even when the bags are packed full. I never tried that and in the end just let the straps flap. The bags have interior stiffening panels to help give shape, but fold down flat for shipping or shoving under the bed between adventures. The volume is 32 litres according to the brochure, but as I discovered here, a flexible, rectilinear box will actually increase in volume when filled with fluids as it seeks to attain spherical equilibrium. Who wouldn’t want some of that. 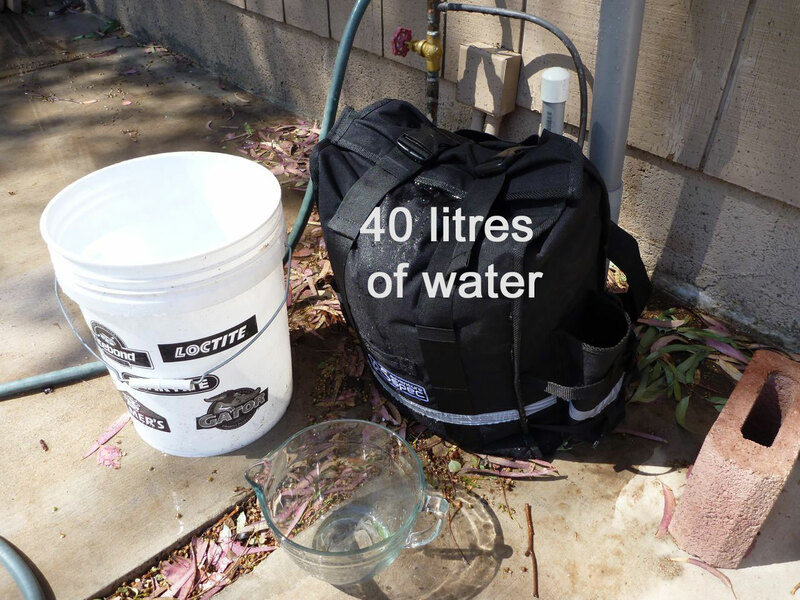 For example, my notional ’24-litre’ Magadans (right) actually took 40 litres of water, and that increase will be the same with any similar flexible rectilinear pannier. So, masses of volume meant I didn’t need an annoying tailpack, and low-mounting probably didn’t do any harm to stability either. Yes, they’re wide because the rack is wide. 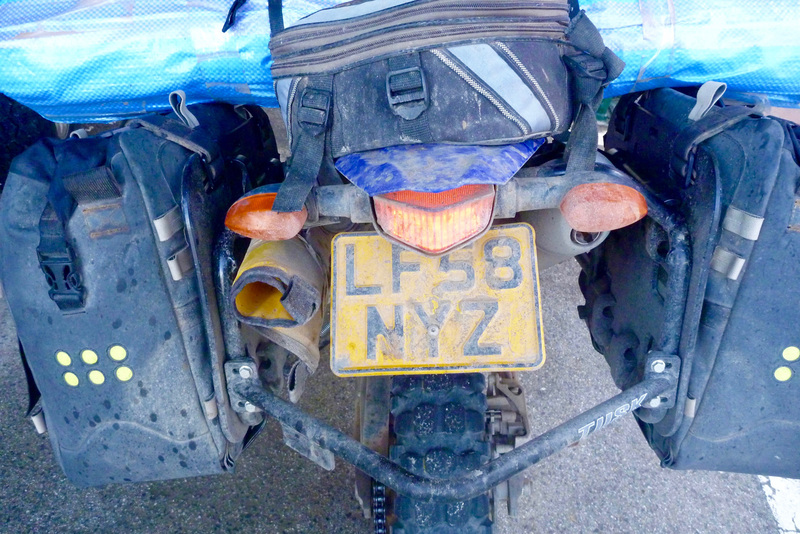 On the chain side I could’ve used the inner space better (just a rolled up 10-L fuel bag, yellow thing on the left). There’s four litres of volume to be had there, easily. A Rotopax won’t fit. On road and trail the OS-32s never missed a beat or felt annoying to use. In fact the pulling up of the anchor buckles and then cinching up were quite satisfying actions – I suspect ‘actuation gratification’ (the satisfying click of a clip, for example; there’s probably better jargon for it) may be something that better designers think more about than others. 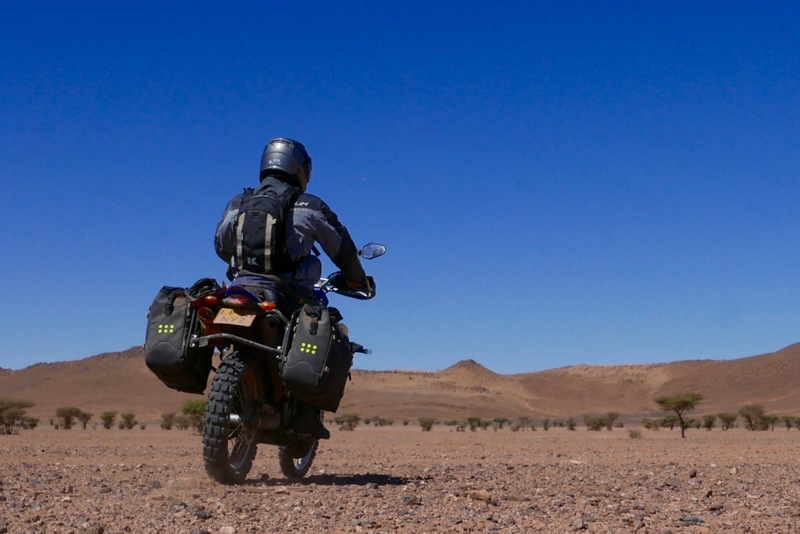 Your OS32s are a travel solution to long overland journeys. 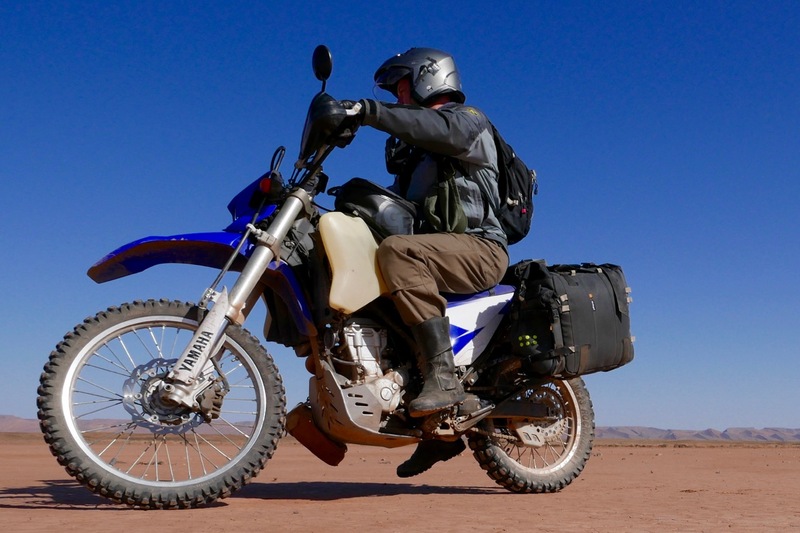 For dirtbike weekends or fast and light BDR-ing, I imagine a GL Great Basin, Mosko Moto Reckless, or alternative Kriega packs will suit riders prioritising agility. 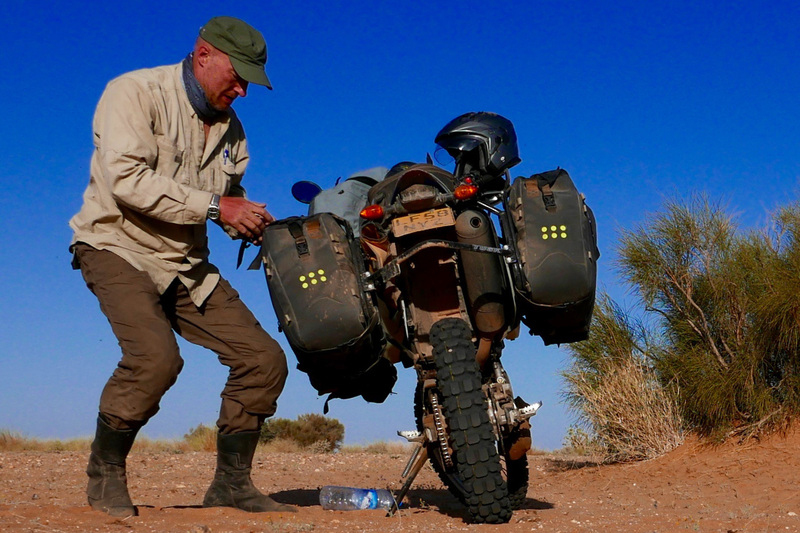 Me, I’m more of a traveller and prefer big, side-mounted saddle bags with minimal junk loaded on top. Slimmer would be nice, but that’s just conventional rack design and high dirt-bike pipes for you. The Mags are still great bags and bound to be cheaper. The OS-32 kit as I used it with plates and two pockets would come to £710. That’s a lot of money, but of all the accessories you lash to a genuine travel bike, surely the baggage system is the most critical and will be the most used. I hope to carry over these OS-32s to my next adv bike. Good job Kriega, a well thought out bit of kit. 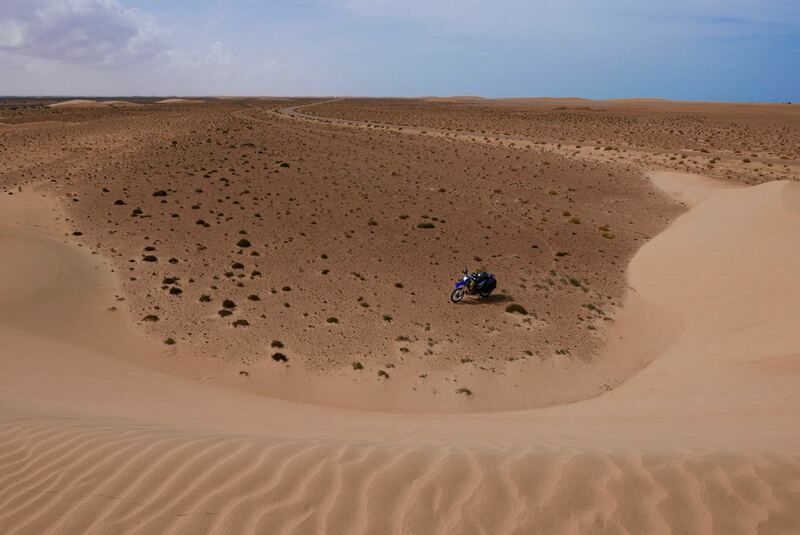 For more images from my ride in Morocco, see this. 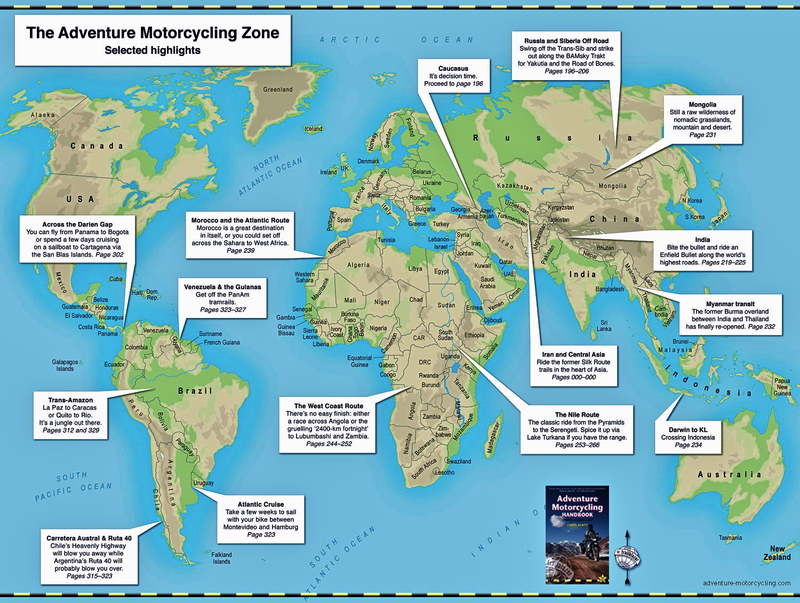 This entry was posted in Adventure Motorcycling Gear Reviews, AMH News, Luggage, Project Bikes, WR250R and tagged attaining spherical equilibrium, kriega OS-32 review, kriega OS-32 tested, kriega overlander, kriega overlander system review, kriega overlander system tested, kriega overlander-S. Bookmark the permalink.